Wisconsin has numerous well-respected pediatric and neonatal medicine programs, including the Children’s Hospital of Wisconsin in Milwaukee, WI. This facility is, for example, ranked #11 in Children’s Neonatology Hospitals and #13 in Children’s Orthopedic Hospitals in the United States for the 2015-2016 year by U.S. News and World Report. While Wisconsin’s pediatric and medical facilities are known for their quality of care and high rankings, however, it is important to remember that medical professionals can still make errors. When these errors touch the lives of fragile and vulnerable newborn babies, they have a huge impact and can potentially cause serious and lifelong disabilities. 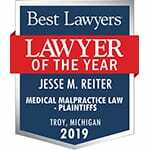 If you suspect that your child or loved one had a birth injury, call Reiter & Walsh ABC Law Centers at 888-419-2229 to pursue justice and ensure that they will be well cared for no matter what. We can help you pursue justice whether you are in Milwaukee, Madison, Green Bay, Kenosha, Racine, Appleton, Waukesha, Eau Claire, Oshkosh or any other Wisconsin city. Unlike other other medical malpractice firms, which also focus on other topics as device malfunctions, adverse drug reactions or allergies, we focus solely on birth injury, providing us with the deep knowledge needed to successfully litigate these medically complex cases. Our unique focus allows us to work with top medical specialists, life care planners and other experts that can help you secure your child’s care throughout their lifespan. We can be contacted 24/7 at 888-419-2229, via chat, or by clicking here. There are numerous hospitals in Wisconsin that provide intensive care to critically ill children. Many children with birth injuries require an NICU stay; during their NICU stay, they may need hypothermia therapy (brain cooling, which helps their brains recover from birth injury), help with breathing, and other services to ensure they are in stable condition. It’s important to note that not all hospitals provide all services, so it is key to research hospitals on an individual basis to see if they provide care that a baby needs. In most cases, Level III or Level IV NICUs can provide specialized birth injury care. If a hospital, medical center or birthing facility where a baby is delivered cannot provide certain services (such as emergency C-section capabilities and neonatal intensive care), they must be able to provide rapid transit to facilities that do. While this is by no means a comprehensive list, the following list indicates some of the Wisconsin hospitals that offer either Level III or Level IV NICU care. Children’s Hospital of Wisconsin Milwaukee NICU (Milwaukee, Wisconsin): A Level IV NICU co-located with a birthing center. Children’s Hospital of Wisconsin Fox Valley NICU (Neenah, Wisconsin): A Level III unit for premature and critically ill infants in Northeast Wisconsin. Aspirus Wausau Hospital (Wausau, Wisconsin): A Level IIIA NICU based on a private care room model. Wheaton Franciscan Healthcare: This healthcare system has two separate Level III NICUs – one at All Saints Hospital in Racine, WI and another at St. Joseph in Milwaukee, Wisconsin. Columbia St. Mary’s (Doerr Family Newborn Intensive Care Unit) (Milwaukee, Wisconsin): A Level III NICU in southeast Wisconsin. ProHealth Care (Waukesha, Wisconsin): Has a Level III NICU and birthing center suites. American Family Children’s Hospital (Madison, Wisconsin): A Level IV NICU which cares for infants that need complex surgery and/or sub specialty medical care. Ministry Saint Joseph’s Children’s Hospital (Marshfield, Wisconsin): The only Level IIIB NICU in central and northern Wisconsin. Aurora Healthcare System has four birthing centers with attendant Level III NICUS in Green Bay, Wisconsin (Aurora BayCare Medical Center in Green Bay), West Allis, Wisconsin (Aurora Women’s Pavilion of Aurora West Allis Medical Center), and Milwaukee, Wisconsin (The Birthing Center at Aurora Sinai Medical Center). Gunderson Health System (La Crosse, Wisconsin): Has a Level III NICU. UnityPoint Health – Meriter (Madison, Wisconsin): Has a Level III NICU. HSHS St. Vincent Children’s Hospital (Green Bay, Wisconsin): Has a Level III NICU. While the following American Academy of Pediatrics pediatric resource directory is several years old, it may be a useful starting point for parents searching for other medical care resources. Wisconsin is home to numerous medical research programs and organizations, including the University of Wisconsin School of Medicine and Public Health’s Wisconsin Institutes for Medical Research, the Children’s Hospital of Wisconsin, the Aurora Research Institute,the Medical College of Wisconsin’s Neonatology Division and the Wisconsin Network for Health Research (WiNHR), which pulls together thousands of researchers conducting clinical research in such diverse areas as cancer care, cardiology, neurosciences and women’s health. Wisconsin has two ABA-accredited legal programs at the University of Wisconsin Law School and at Marquette University Law School. When a parent first suspects their child has a birth injury, it can be difficult to know where to start when getting help. Because these diagnoses are very complex and can often be related to other health issues, understanding what happened to a child can be a very daunting task. If a parent suspects that their child has a birth injury, it may be a good idea to speak to an attorney who specifically practices in birth injury. Experienced birth injury attorneys are well-versed in interpreting medical records and can help decipher the events at birth to determine whether the injury was due to medical malpractice. Birth injuries are not always immediately obvious. Sometimes a child might show signs of a brain injury soon after birth (if they have seizures, or aren’t breathing at birth, for example). In other cases, these injuries show up as developmental delays as a child does not roll over, crawl, walk or talk at the expected times. In other cases, this may manifest itself as cerebral palsy, motor difficulties, or an early preference for one hand over another. It can also manifest itself in cognitive, intellectual, learning or developmental disabilities once the child has begun to grow further. When a birth injury is suspected, it is very important to speak to medical professionals as soon as possible – the sooner a diagnosis can be confirmed the sooner intensive therapy can start. The sooner intensive therapy starts, the likelier it is that the child will have better outcomes. Often, the cause of a birth injury can be traced back to specific events that did or didn’t occur during pregnancy, labor and delivery. While the presence of these events will not necessarily indicate a birth injury, they do greatly increase the risk that the child will have a birth injury. If a child has developmental delays, motor disabilities, or other neurological abnormalities not associated with genetics, it can be worth having a birth injury attorney review your medical records and help you understand what happened to your child. If they find that medical malpractice did occur, you may choose to file a suit to provide for your child’s future care. Having a baby should be a joyful experience. When a child’s birth is impacted by medical complications, parents can sometimes find it difficult to get answers for questions about how to best pay for their child’s care and where to get the care their child needs. At Reiter & Walsh ABC Law Centers, we hope to not only help you understand what happened at your child’s birth, but also help you be secure in the knowledge that your child’s care will be paid for throughout their lifetime, no matter what. We work with a highly knowledgeable team of medical specialists, life care planners and forensics experts to make sure your child will get the justice they deserve. The Wisconsin birth injury lawyers at ABC Law Centers focus only on birth injury, unlike other large personal injury firms which can split their time between cases relating to nursing homes, auto accidents or medical device malfunctions — hugely disparate fields. Our attorneys’ 90+ years of combined experience in birth injury litigation provide us with the knowledge needed to win these complex cases, and we are one of the few birth injury firms that have in-house medical staff that assist us in our investigations of your medical records. As evidence of our success, we invite you to look at our extensive track record of multi-million dollar verdicts and settlements. We would be happy to provide you with a free, no-obligation case review. You information will be kept completely confidential. Fee free to reach out to us 24/7 via phone 888-419-2229, live chat or contact form.